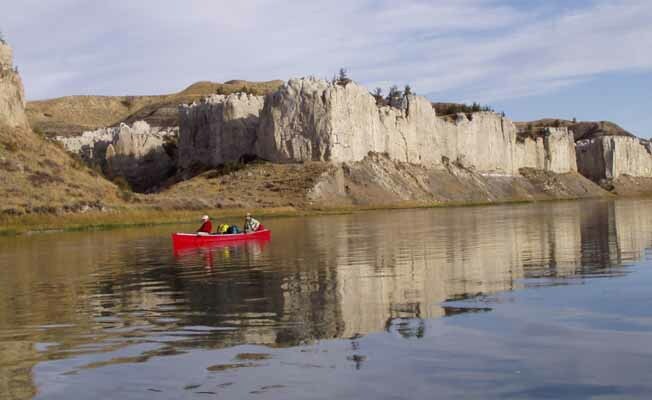 Upper Missouri River Guides provides guided canoe float trips along the full 149 mile stretch of the Upper Missouri National Wild and Scenic River. Since 1994, we've guided hundreds of clients on this wild and scenic river, and have published a guidebook for the river. The Upper Missouri is our specialty, and is the only river we guide on. We are a family-owned Montana business, operated by Glenn and Nancy Monahan. Trips include all equipment and meals. The Upper Missouri is a wilderness float trip. A number of tripping options are available, including 46 miles in 3 to 4 days; 88 miles in 4 to 5 days, 108 miles in 6 days and 149 miles in 6 to 7 days. All of these trips involve primitive camping along the river and transporting your gear (which we provide) in your canoe. The Missouri has no rapids and can be safely enjoyed by anyone who is reasonably fit and loves the outdoors. Due to its remoteness and rugged beauty, the Upper Missouri offers unparalleled solitude and serenity -- a refreshing change from the fast pace of modern times. We structure our trips to allow you lots of quiet time on the river with your paddling partner. We're proud of our knowledge of the river's history, geology, and ecology which we will share with you, if you're interested. There are opportunities to visit 13 Lewis and Clark campsites, fur trading post sites, abandoned homestead buildings, and Native American habitation sites; there are hiking opportunities to spectacular off-river locations. Our canoes are built by Wenonah Canoes of Minnesota, widely recognized as the finest canoes available. These canoes are vastly superior to mass produced plastic or aluminum canoes and excel in qualities, such as paddling efficiency, sea worthiness, stability, cargo capacity and comfort. We also utilize 12 ounce carbon fiber paddles, which virtually eliminate upper body fatigue.